This is the first in our regular profile interviews where we interview an author with a fascinating and inspiring real life story of their own to tell. Katy Colins is the author of The Lonely Hearts Travel Club series. Katy found herself the subject of national interest in the few days before her first novel, Destination Thailand, was published. I chatted to her about her writing journey and what it felt like to be in the middle of a media storm. Can you imagine walking through an airport, picking up a newspaper and finding yourself in your bikini on page three? This is what happened to debut author Katy Colins in January of this year. Her novel, Destination Thailand, was due to be published that week, as an ebook by Carina. To create publicity Katy had written a press release. A press release that efficiently captured the attention of the nation. Type Katy's name into google and you'll find articles about her in the Liverpool Echo, The Mirror, The Sun, The Daily Mail, The Daily Telegraph, and The Metro. She’s given interviews to Good Housekeeping magazine, the BBC and appeared on This Morning with Philip and Holly. The media dubbed her the 'backpacking Bridget Jones'; the 'jilted bride' who changed her life by going travelling. 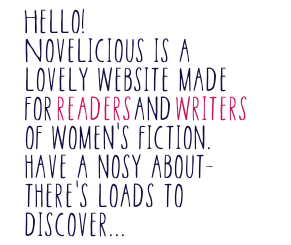 It was the travelling that inspired Katy to start writing both a blog (NotWedorDead.com) and a novel. Taking heed of the expression ‘write what you know’ Katy’s heroine of Destination Thailand decides to go travelling after she, too, was jilted. Thanks to the publicity the novel, when released, quickly flew up the charts. When I sat down with Katy a few weeks ago to chat about her writing journey she was in complete amazement at the course her year had taken. In the space of eight months Katy has three novels to her name with a fourth due out next year. After Katy’s relationship with her fiancé ended Katy based herself in France where she began teaching English. Teaching left her with a lot of free time, and, because she didn’t fully understand the language on the TV, she began writing. Her first submission was to the Sunlounger anthology. Her short story didn't place but Katy now had the bare bones of her first novel. Katy went on to apply to the WoMentoring Project to be mentored by Cesca Major. She'd read Cesca's first novel as Rosie Blake and said she "seemed fun, she could relate to her." It was Cesca who advised Katy to set herself a deadline. “My deadline was to find an agent before I was thirty," said Katy. The deadline gave her impetus. Despite having little cash she joined a writing retreat, met other writers, then felt ready to submit to agents. She was met with silence. Undeterred she submitted directly to a publisher. Both Carina and Bookouture accept un-agented manuscripts. Katy was offered a three-book deal with Carina just one month after she turned thirty. Her debut was scheduled for January 2016. But in December 2015 Katy was feeling low. She'd moved back to England from France, had no job, no money coming in, and was doubtful she could support herself by writing ebooks. She felt “in a sea of ebooks” it would be difficult to make it a success. Katy’s dad insisted that you never knew what was around the corner. He was right. Because Katy had a plan. So she decided to write a press release. In it she told her true story of jilted bride beginning a new life by travelling which then led to a book deal. The timing was perfect. It was a gloomy, uninspiring week in January and the press release attracted the attention of The Liverpool Echo. Interest gathered and Katy’s story was at the top of the paper's Facebook page eclipsing a story about Liverpool Football Club. It was only a matter of time before the national press noticed her story. Katy wasn’t expecting national interest at all and was currently on her way to the airport to catch a plane to the Philippines. Which is when she saw herself in The Daily Mail on page three. It was all beginning to snowball. An interview with Good Housekeeping Magazine and the BBC was conducted in haste at the airport making Katy the last person to board the plane. On arrival she switched on her phone which immediately began bleeping and notifying her of countless messages and texts, with thousands of new followers on instagram and twitter. There was even a poll about her in one of the papers. Then, on her own waiting for her next flight, Katy was given her dream news. Her novel was going to be published within a few weeks in paperback. Katy was in shock and utterly overjoyed. "I was waiting for someone to tell me it was all a joke." Then Katy had to keep this news to herself because she had to board a plane for yet another long flight. As she arrived in the Philippines and the media storm continued, more stories appeared about her in the press. It had taken on a life of its own. This was where Katy was interviewed by This Morning where she propped her phone up on a tub of Nivea and chatted to a blank screen, answering questions from Holly and Phillip through an earpiece. Holed up in a hotel, fielding calls from the media, Katy realised she needed the support of an agent. She flew back home just four days later – and now she had the choice of who she wanted to represent her. Those few weeks in January and February were, she says, an absolute whirlwind. Her books broke records at HarperCollins for fastest digital to print turnaround. Katy saw her novel as a paperback just a few weeks later in the local WHSmiths. And, she says, "the whirlwind hasn’t really stopped since". With everything that was happening did Katy actually get any more writing done? “I’ve written my fourth book, Destination Australia,” said Katy. A trip earlier this year to Australia helped with her research. Her fifth book involves travelling to Bali. So any guesses where her heroine travels to in that one? The Lonely Hearts Travel Club is the hilarious and heart-warming series of travel-themed novels by author Katy Colins.